along with the celebration of festivals.Traditionally it was cooked in the earthern pots. 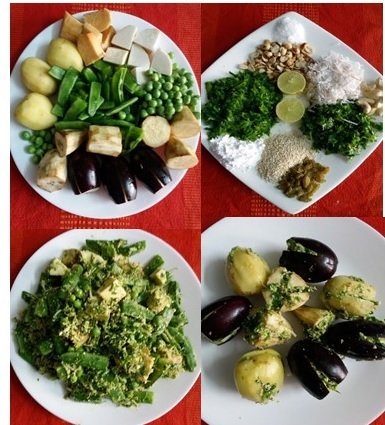 But I have used pressure cooker for fast cooking.In diffrent parts of Gujrat it is prepated in diffrent ways.Undhiyo is a nice combinatin of diffrent herbs and seasonal vegetables.Few blog reader requested for this receipe .Hope you people enjoy it. Mix all the ingredients of muthiya to make a soft dough,dough may be little sticky then add more gram flour.Grease your hand with little oil and make oval shape muthiyas.Deep fry muthiyas on medium heat till golden brown . 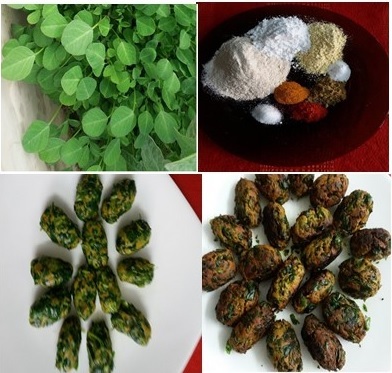 Chopped coriander leaves 50 grams,green garlic 50 grams, ginger 1 inch,roasted skinless peanuts 100 grams,roasted sesame seeds 2 tablespoon,fresh or dry grated coconut 1/2 cup,sugar powder 2 tablespoon,green chillies 5/6,lemon juice 2 tablespoon,salt to taste. Cut ginger ,garlic and green chillies and make a rough paste,half crush the roasted peanuts and mix with salt,sugar powder and lemon juice. Clean surti papdi,string and cut into halves,peel the potatoes,yum,sweet potato, and cut into cubes. Take half of the green masala and mix in the vegetables(surti papdi,yum,sweet potatoes)and marinate for 15/20 minutes. Now heat the oil in pressure cooker/ deep bottomed pan and also take the remaining oil used for frying muthiya because it added extra flavour to Undhiyu.Add carom seeds and asafoetida in the oil,when starts spluttering add surti papdi,yum ,green peas,all powdered masalas and salt.mix well and cook for 5 minutes. Add i cup of water then add methi muthiya over it.Close the lid and cook on medium heat for 2 whistle.Open the lid after pressure comes out naturally. Do not over mix the vegetables gently take out it,because muthiya and cooked vegetables may break.Garnish with fresh coriander leaves.